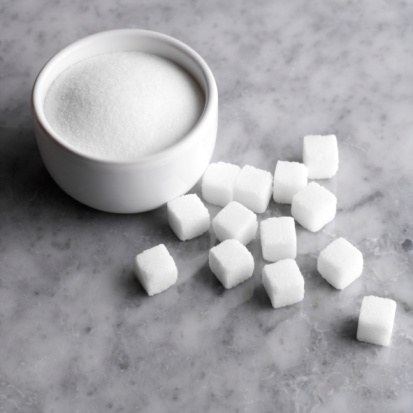 Fit for Success: My Thoughts on Sugar! Sugar. Delicious, not so nutritious, and hidden in SO many food products! This week, I have become much more aware about how much sugar is REALLY in the foods we eat. While 10g of sugar in a bowl of cereal or granola doesn't sound like much, it adds up SO quickly! Hence, my blog for today. Beware of all the sugar you are consuming. A banana contains 14g of sugar! 1 apple can have up to 23g of sugar! Like I said, it may not seem like a lot of sugar, but BEWARE when it adds up over 24 hours!!! -Instead of having a bowl or two of cereal in the morning, try "Lower Sugar Maple Brown Sugar Oatmeal" which contains only 4g of sugar. Better yet, throw an egg and an egg white on the stove for a zero-sugar breakfast! Vegetables will make it even more delicious. "Light" english muffins only contain 1g of sugar. -Be conscious of the sugar you are adding in your coffee, on your fruit, in your favorite sweet treats, etc. -Remember that all food groups are okay in moderation... avoiding all sugar doesn't mean you should overload on carbohydrates or bad fats! Avoiding extra sugar doesn't mean you should feast on artificial sweeteners (Splenda, Diet Sodas, etc). These are CHEMICALS that your body CANNOT digest! While they have zero calories and zero grams of sugar, your body is not made to digest them...... therefore, you pee them out. Gross, huh? Even worse (for us ladies), they bloat you! No one enjoys that. Honestly, natural sugar is the better route to go in this case. Well, that is all for my sugar lecture! Today I was realizing how hard it is to avoid sugars, so I hope I inspired you to take this into consideration!